UPS is now using biodiesel blends at its Louisville, Kentucky hub. The company recently installed a biodiesel fuel tank and fueling station at its Worldport facility. This will enable fuel operators to blend specific percentages of biodiesel starting from a B5 blend (5% biodiesel, 95% diesel) up to B20. Biodiesel blends of up to B20 can be used in any diesel engine without any modifications. The 30,000 gallon biodiesel tank and station at Worldport fuels nearly 200 vehicles and diesel equipment, most of which help load packages on and off the planes. 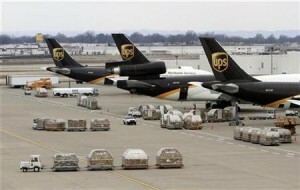 Worldport is the size of 80 football fields and each day loads 100 airplanes and processes 416,000 packages an hour. Joe Jobe, CEO of the National Biodiesel Board considers UPS’s switch to biodiesel “monumental”. “For a giant like UPS to use biodiesel is not only an outstanding vote of confidence for biodiesel, but an example of how America’s first advanced biofuel will fuel the drive towards genuine corporate sustainability,” said Jobe.